Subsequent to the publication of “Novel, Small Molecule induced GABA-hATSCs for Targeting of Neuropathic Pain” by Jee et. al. (online ahead of print March 2013; DOI: 10.1089/hum.2012.097) in Human Gene Therapy, we became aware of four papers that were retracted from Antioxidants and Redox Signaling from this same group (Im et al, 2012; Choi et al; 2012; Jang 2012a; Jang et al 2012b). A routine analysis of the Human Gene Therapy paper for similarity to other previously published papers revealed a high degree of language identity with two of the retracted papers, including parts of the Results section. This raises concerns about the integrity of data within the Human Gene Therapy paper. The editorial leadership of Human Gene Therapy therefore has decided to retract the paper from Human Gene Therapy. The previously published retraction in Antioxidants and Redox Signaling indicates that officials from the institution where this research was conducted have initiated an investigation. Human Gene Therapy is dedicated to upholding the strictest guidelines of scientific publishing and does not tolerate any impropriety. 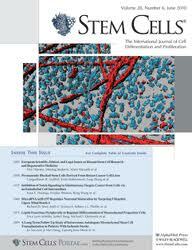 The above article from Stem Cells, published online on 26 June 2008 in Wiley Online Library (wileyonlinelibrary.com), has been retracted by agreement between the Senior Editors of STEM CELLS, AlphaMed Press, and Wiley Periodicals, Inc. The retraction has been agreed upon following an investigation by the Committee on Research Integrity of Seoul National University and the Senior Editors of STEM CELLS. By a preponderance of the evidence, the Committee concluded that this paper contained intentional manipulations, including fabrication or falsification. The Committee further concluded that data in Figures 2A and 4C are identical; that data presented in Figure 2A are identical to and fabricated from figures presented in four other papers published by Professor Kang; and that data presented in Figure 2B are identical to and fabricated from a figure presented in one other paper published by Professor Kang. Retraction notice ‘that is, the text supplied by Legal’. We also learned some background on the case from Keon Hyung Park, a reporter for the Seoul Daily who picked up the story following our posts in 2012. Ivan had the pleasure of meeting Park last year at the World Conference of Science Journalists in Helsinki, and he sent us some details of what happened in the investigation. Among 70 slides which are reported to Retraction Watch, 22 slides are certainly fabricated. Even the professors Kang admitted that she fabricated the slides. Due to the lack of materials, the rest of slides cannot be identified whether they are fabricated or not. And, they said, while Kang took a leading role in the research, she tried to claim that a student was responsible, that “it was mistake,” and that she “could not submit the original copy of the research because it was lost.” However, the committee didn’t accept that explanation, and also revealed text messages in which she tried to convince graduate students not to testify against her. In January 2013, the committee announced that it had determined that Kang had fabricated results, and recommended firing Kang. The University did so on March 8th. Separately, the university investigated Professor Kyung Sun Kang, an influential stem cell researcher who worked with Soo-Kyung Kang. Kyung Sun Kang escaped with just a warning, with the committee saying that even though there was a mistake in his research, it was by a graduate student. Due to the report by Retraction Watch, there was the biggest impact, after the case of a former Professor Hwang Woo Suk, in the Seoul National University, which is recognized as the best university in South Korea by most people. I, who reported this case to Korea at that time based on Retraction Watch, was given the “reporter of this month” award by the Journalists Association of Korea. I give thanks to Ivan Oransky and Adam Marcus. I think this is a meaningful case because it came to be an opportunity to the world of science, as well as the community of Korean universities, reconsider research ethics. I hope Retraction Watch will continue to observe actively. To that we say: Thank you, and we will!